Today we discuss how to install Xposed framework on Android marshmallow 6.0.1/cm13. 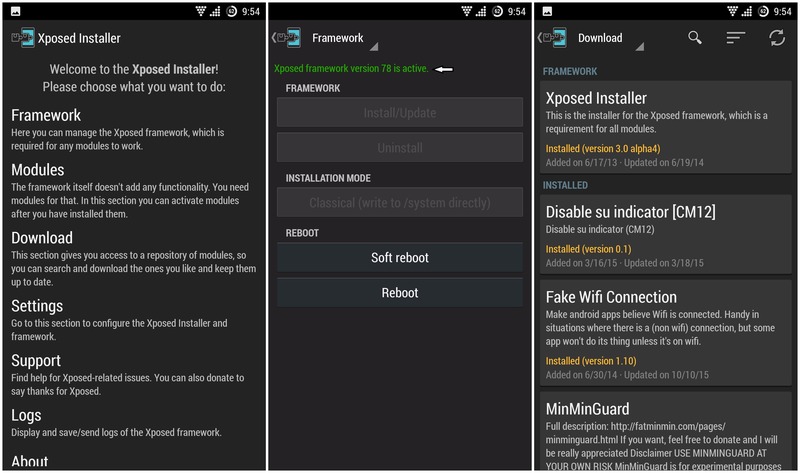 Xposed framework is already available for Android KitKat and Lollipop, and now you can use the Xposed framework on Android 6.0 marshmallow/cm13 too, thanks to its developer @rovo89. Like the lollipop, direct installation is also not possible in marshmallow ROMs, and you have to flash Xposed framework via custom recovery. Samsung Users plz follow – How to install Xposed on Samsung Devices. What is Xposed: – Xposed is an app for root users that allows you to install different modules to customize your phone. The primary motive of the Xposed framework is to get all customization and features you found on a custom ROM to your Stock ROM. You can also use Xposed with custom ROMs, and not every ROM has all features, and everyone has different views on customization so you can choose the modules you love and get your own personal customization. Xposed is for those people who wants to stay with stock ROM but want some system level changes in their phones. Check How To Install Xposed Framework On Android 6.0 and 6.0.1 Marshmallow from below. With Xposed modules you can add custom tiles to power menu, notification drawer, add status bar customization, add an on-screen navigation bar, you can also use the multi window to use two apps on one screen. Also, you can use all in one tweaking module like Gravity box or Xblast tool. These are some information about Xposed now we discuss how to install Xposed framework on Android marshmallow/cm13 but before proceed you have to download some files first. This app needs a rooted device. 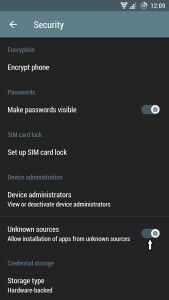 You can check how to root an android phone. You must have a custom recovery installed. 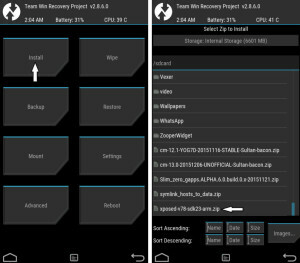 For safer side take a complete backup from TWRP recovery. The user with Samsung stock ROMs may face bootloop issue. Many popular Xposed modules still not working for now as Xposed for marshmallow/cm13 ROMs is still in its early stage. 1) First, make sure you have enabled ‘Unknown Sources‘ option. You find it here Settings –>Security –>Unknown sources. 2) There are three different versions of Xposed framework available for different types of CPU’s. 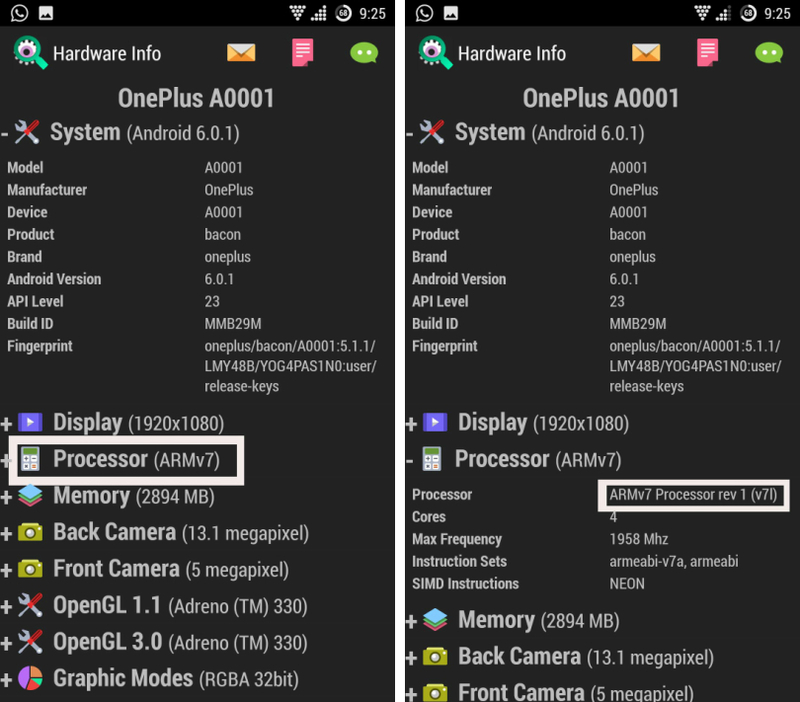 To check your CPU architecture install the app called ‘Hardware Info‘ from play store, open it and click on the processor. 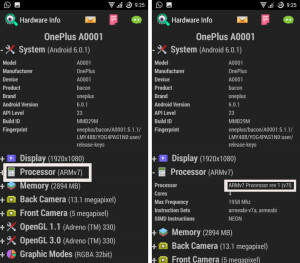 It will show you which type of processor your device have. 3) Download the suitable framework zip and Xposed installer for your device and move it to your sd card. 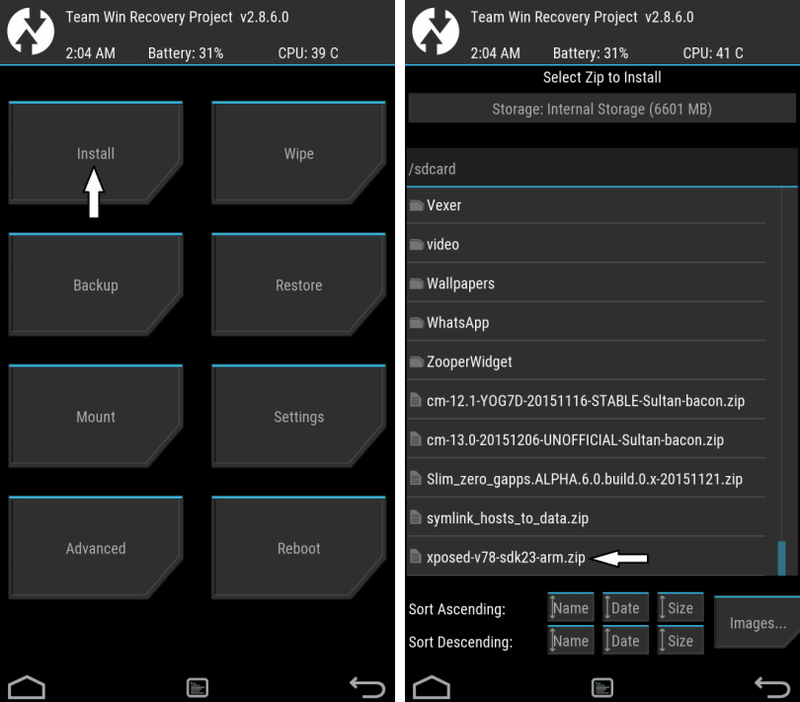 4) Reboot your phone into Recovery mode. For most of the phones its a combination of ‘Power +Volume down’ for some devices it’s ‘Power + volume up’ and for some ‘power + home + volume down’ button. 6) Simply swipe the slider and select wipe cache/Dalvik and reboot your device. At first boot, it will take some time so be patience. 7) Now install Xposed installer and open the app after installation. Go to the framework and you see that ‘Xposed Framework version 78 is active‘. This means you install Xposed framework on Android 6.0 marshmallow/cm13 device successfully. Now move to the download section and start browsing modules you love. So this is the complete guide of how to install Xposed framework on Android marshmallow. Install the app and search the Module you want and enjoy tweaking your phone. If you have any doubt, ask me by commenting below. Xposed (Marshmallow) for Samsung stock ROM’s still under progress but if you already install a custom ROM on your s4 you can try above method but take Backup first before flashing. Hi Naveen, yes I’m using Oneplus one and I was using xposed v78 but currently I’m using slightly updated version xposed-v79-sdk23-arm. You can use any ‘sdk23’ version. Great. I found this tutorial helpful to install Xposed Framework on my Nexus 7. Hi Akshay, I’m really glad that you like this post. 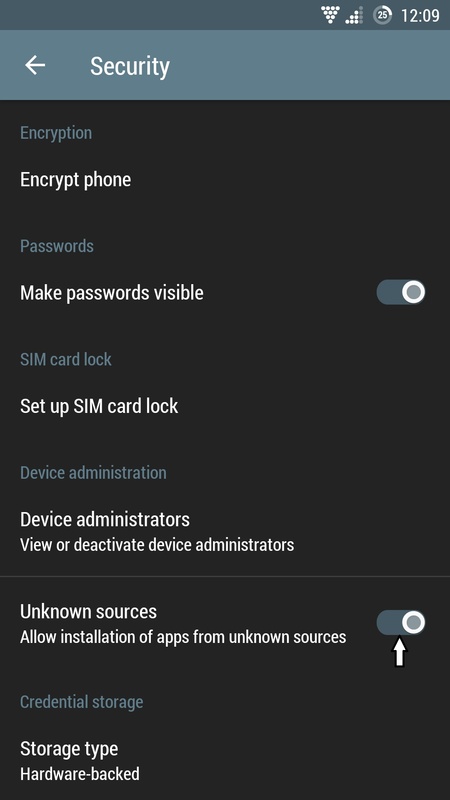 6) Simply swipe the slider and select wipe cache/dalvik (optional) and reboot your device. At first boot, it will take some time so be patience. Try clearing the Cache/Dalvik Cache from recovery or if the problem still same after clearing cache then reflash the Samsung ROM or any other custom ROM. Some Samsung Stock ROM still not working properly with Xposed. Hey guys i recently using custom S7 edge rom on marshmallow 6.0.1 on my Note3 armv7. I have installed Xposed installer V3.0 Alpha4 but i can’t find suitable Xposed framework to use. What can I do? Assist! Vevo Videos Are not getting Downloaded from YouTube pls Suggest . Does this work for armv7 processor? do i just download “arm 32”? Minmin not available with Xposed? It was a great adblocker. Any chance you know le max 2 (820 chipset) can be rooted and cm13 can be installed? in this point 6) Simply swipe the slider and select wipe cache/dalvik (optional) and reboot your device. At first boot, it will take some time so be patience. on my xiaomi redmi note 3 pro arm64 says : Xposed framework version 86 is installed, but not active. Please check the logs for details. You need to flash Xposed Framework from TWRP Recovery to install Xposed on Xiaomi redmi Note 3. My phone had gone bootloop. Please suggest me a framework which compatible with my phone.